Yakir Aharonov, Ph.D., is professor of theoretical physics at Chapman University, where he holds the James J. Farley Professorship in Natural Philosophy. 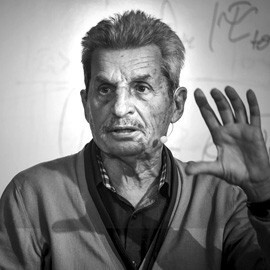 Considered one of the most highly regarded scientists in the world, Dr. Aharonov received the prestigious Wolf Prize in 1998 for his co-discovery of the Aharonov-Bohm Effect, one of the cornerstones of modern physics. Prior to coming to Chapman University in 2008, Dr. Aharonov served on the faculties of Brandeis University, Yeshiva University, Tel Aviv University, the University of South Carolina and George Mason University. He holds the title of emeritus professor from Tel Aviv University. Although Chapman University -- where he conducts research, teaches and lectures to undergraduate and graduate students in the Schmid College of Science and Technology – is his sole full-time affiliation, he also serves as distinguished professor with the Perimeter Institute in Ontario, Canada, a research think-tank where he meets and works with an international roster of renowned fellow members such as Stephen Hawking , Leonard Susskind and Juan Ignacio Cirac, among many others. Dr. Aharonov's current research with Chapman University team members Menas Kafatos, Ph.D., Jeff Tollaksen, Ph.D. and participants from other universities includes a grant awarded from the Science and Transcendence Advanced Research Series (STAR) for a project titled "Subjective Experience as a Window on Foundational Physics." The aim of the project is to investigate the areas of tension between objective scientific description and human conscious experience.